Very cool there John! I never had a 2200, but I had a 2800 and a 3100 that I still have. Bought it new. I fired it up a couple of months ago and while all the controls seem to work fine with no scratchiness, it has a lot more "birdies" than I remember. Maybe I'll get around to figuring it out before I pass on to the great beyond! Great find, it looks like its in pretty good condition. My father purchased one new many years ago and used it so much he worn out the tuning cap. I tried readjusting the plates and the bearing tension but was unsuccessful in stopping the plates from shorting out in certain areas. Let me know if see any junker RF-2200 for sale. Matt, that is a good looking radio. How does it compare with the 2200, feature-wise? Feature-wise they're pretty much the same. The RF-3100 has a DRO and breaks SW down into 29 distinct 1 MHz band segments extending from 1 to 30 MHz. But the RF-2200 has a rotatable MW antenna which helps a lot when chasing MW DX or for just listening to MW for that matter. The Digital ReadOut on the 3100 is a great convenience. Shotwave performance is much better with my 3100 than with my 2200, FM performance is nearly equal but the AM band, while adequate, is not nearly as good as it is on my 2200. The RF-3100 has a completely different "feel" to it compared with the 2200. 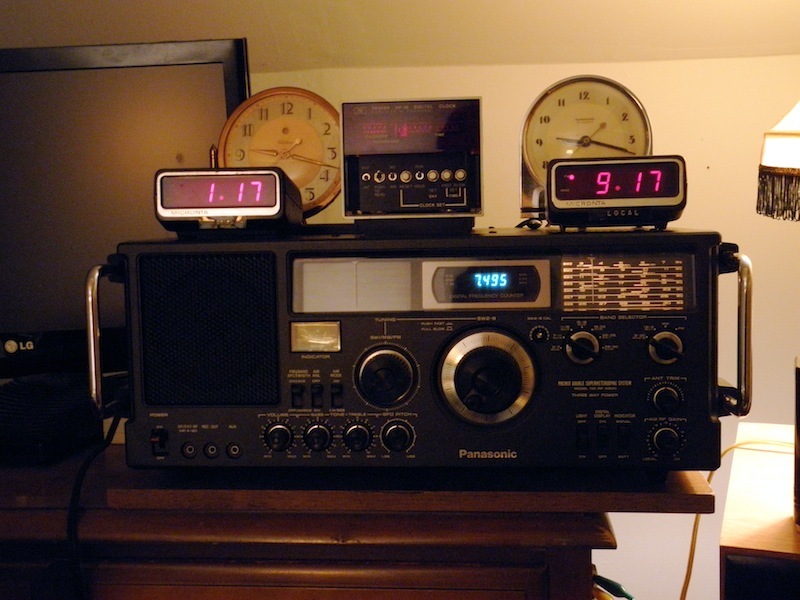 I like both radios. Your right, the gap between the capacitor plates are extremely small which really makes it much harder to repair.. I hope that you find out why its not working as well as it was before being disassembled. This thread revived my interest in my 3100. As it turned out the "birdies" I was hearing were due to my Bose wireless Bluetooth speaker in close proximity to it. The Bose was turned off and on battery power, but apparently the circuitry was still live. WTH is it doing while it's turned off and on battery power? I agree with Dave's overall consensus. I never considered it to be a serious contender on MW due to it's large footprint and fixed ferrite antenna. Rotating the thing around to receive a signal is totally impractical. However it is still very good for SW reception! 36 years old and the thing is right-on frequency-wise on every band and extremely stable during SSB reception! If the voltage reg caps go dry, the thing might oscillate a mighty signal, with birds abounding. Maybe the Bose is still on because it has to be engaged to activate? RE: Panasonic: could you put it on a lazy susan, and turn it that way? Or, use an external loop, and just place the loop near the radio, and turn the loop, while the radio remains stationary. That works with my Superadios. Very cool! I have an RF-2200, which was given to me by a relative, who apparently found it at the local dump! It powers up and works fine on FM, but seems to be dead on MW and SW. I opened it up and cleaned the switches as best as I could, but it didn't help. Hopefully, it's something relatively simple. Adam, that is a good looking radio! Yes---that's a great looking rig ! Panasonic sure has put out a lot of great products through the years ! "Tuning meter not working on FM"
Don't sweat too much on this issue - I have a couple of radios, not Panasonics, that have this "problem". Searching through the schematic showed that this is deliberate. When you think about it, signal for VHF FM is either there or it's not - there's a limiter circuit in there that has very high gain to clip any amplitude variations such as noise, so the signal strength meter would have been pegged full scale on the smallest of useable signals - the frequency deviation is the same whether it's a weak or strong signal. I agree with Martin about the tuning meter on FM. When no signal is tuned in, the fluctuating meter is responding to noise which you probably will hear as "hiss". The meter is useable only with the weakest of FM signals but it is a help in getting the best antenna orientation for those stations. The meters on most Panasonics in the Command Series (RF-2200, 2600, 4900, etc.) seem to respond in this manner. Guess it actually does do something when a "no signal" spot is found ! And man, is the sound quality excellent with this radio on FM !